Mylene can’t believe it, and neither can I. This episode was AWESOME. Coming off of episode 9 in which Mylene gives life to a burned out songstress older than her (the Sheryl to her Ranka) through her singing, Basara and Ray do the same dance, as only two dumb hotblooded boys can. These days the big heartstring pullers always seem to be young girls going through emotional arcs or maybe long-suffering boys going through depression (think Kousei from KimiUso or Rei from March comes in like a lion), but I can’t remember the last time I saw older male character—let alone one who isn’t a lead character—with a backstory as gut-punchingly great as Ray’s. Every step Basara takes towards his dream of making everyone listen to his song is now amplified through Ray. 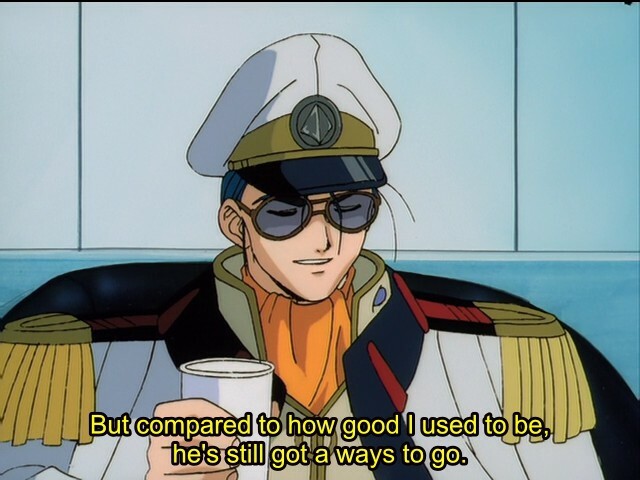 This episode opens with Ray hauling off Basara’s V-19 to get maintenance done on it, revealing that he’s in cohorts with another former ace pilot, none other than the legendary Maximilian Jenius himself, now a captain. Of Basara’s skills as a pilot, Max wryly observes, with the confident bluster of a true ace—”he’s still got a ways to go.” But he has the potential, and the spirit, and that’s why he is Ray’s new dream. Which is of course the most ridiculous dream, if you know Basara even a little, as Mylene certainly does. She can’t even fathom what Akiko is telling her. Basara… ? The “men are silly, and can’t be reasoned with logically” theme from the beach episode gets a reprisal here, which is fitting given that Basara’s constant yelling about how you have to sing music from your soul and make songs more explosive than missiles. Also Basara is dumb in general, and so is Ray for putting his hopes and dreams into kid who just wants to sing to the aliens. But gosh damnit, it sure is a good kind of dumb. The former soldier whose eagerness to fight got his friend kill finds solace and hope in a boy who can barely convince himself to fire a single non-lethal missile even when people are in danger, who gets upset because he had to throw a punch to protect a friend. I observed on Twitter recently that Basara has it a whole lot harder than any other Macross singer, without any magic DNA or protoculture mumbo-jumbo automatically kicking in to force people to listen to his song. All he’s got is hard work, passion, and guts to achieve his absurd and arbitrary goal. But it’s for that naive charging heart of love that Ray can find his own fire and rekindle the spark of life that had diminished in the wake of his mistakes. I wouldn’t really know much about this, but perhaps it’s the privilege of the older generations to dream through the younger. Ray hasn’t reached his goal yet since Basara hasn’t reached his, but he can sit out in the rain and enjoy the pleasure of taking enabling the boy who is his dream. He can delight in each foray, because he’s found new life. We can let him sit out in the rain a bit longer. And when he crawls his way back to the van to listen to Basara’s song himself, he sings along. Kawamori’s not obsessed with the relationship between generations, the past and the present the way Tomino is. He’s more of an Easter-type. Ray finds healing from the scars of his past in the refreshing rain of a new youth. No “old anime is better” nonsense from him—the charging heart of love goes ahead. And the old man sings along. I imagine it’s a spring rain. ← Aniwords – What’s the Deal with Kemono Friends?